All right. I’m cheating. It’s not that I couldn’t find an X-related (or X-rated) subject in Kolkata to discuss, but at this point at least, I prefer not to write a post about Kolkata’s red-light district (save that for Nicholas Kristof) or about the two X-named restaurants I found in the Times of India Food Guide. If you are going to name your venue X-Spicy and Xrong Place, you at least have to deliver on the food. Instead, they advertise “multicuisine”(always a word to steer clear of anywhere in the world) and – sigh – Brittany Spears videos. So, I wasn’t about to take the hour and a half hike to Salt Lake – even for you, dear reader. Thus, the compromise. It’s unclear which country has the highest rates of food poisoning, but a FDA report on a year’s worth of food import violations listed India as having had the most food imports rejected (after the Dominican Republic). A year’s worth of data on imports cannot paint a clear picture of the overall quality of Indian food, but it does show that food can be significantly compromised in the country. 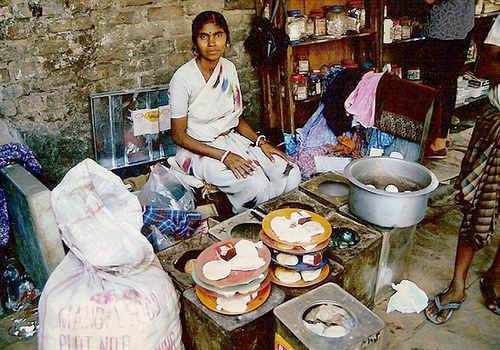 Food poisoning in India results from the same circumstances in any other country – improper agricultural practices, poor hygiene, misuse of chemicals, among others. But one issue that makes India’s food system difficult to manage is a lack of a clear, regulating body. India has had laws on the books for years. But only in 2006 was the Food Safety and Standards Act passed (itself a Herculean effort because it required the consolidation of all previous laws). The Act established the Food Safety and Standards Authority of India, now a center of the regulation process that heretofore didn’t exist. For the past few years I had been lucky to avoid any food poisoning. 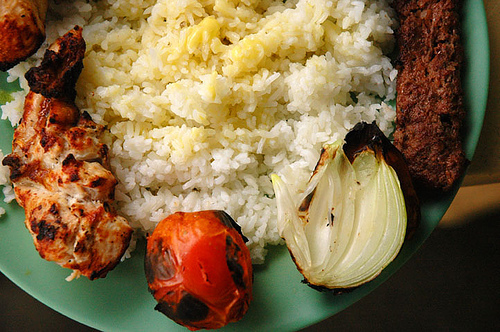 Contrary to what most guidebooks say, food poisoning is not inevitable. But if you are buying a ticket to India, you should accept that it very well might happen. If it does, you’ll be more prepared to take it in stride. My issues largely involved the opposite problem. Most Indians cook their food to death, so that the level of vitamins and other nutrients that end up on your plate are negligible, including fiber. Last summer I realized that diuretics are not a pleasant exercise in health maintenance. I came much better armed this time around. My Metamucil didn’t make too much weight in my suitcase either. But different issues arose. Earlier this week I woke up with that inexplicable, pre-illness sixth sense. The air smelled different. Food didn’t smell much at all, and my fiance Surya smelled way too much. Later in the day, whatever had compromised my sense of smell, pushed southward. By the time we arrived home in the middle of a Kolkata downpour, I lay prostrate on my back. My abdomen churned from cramps. Only occasionally did I turn my head sideways. These were the worst pre-menstrual cramps I’d ever had. Later that night, I spent a number of hours in the bathroom, standing, sitting, crouching on the floor, afraid to leave but equally afraid that the three-inch spider we’d killed in there two days before had a vengeful brother. I had scoured the Internet comparing pictures of poisonous arachnids to the shriveled ball that now sat in a tissue in the dustbin. It was the brown recluse; I was certain. “Those are found in the United States,” Surya said and then pointed to the description on the open Web page. “You shouldn’t trust everything you read on the Internet,” I’d retorted. And the next day, when I was sure I didn’t suffer from PMS, I thought that perhaps Surya had been right about the spider. That was my final thought. I spent the rest of the day shivering under a blanket. Drink only bottled water. Most restaurants and hotels do not use any filter systems for their water, as some middle and upper class homes have. It’s best not to wonder whether or not your water is clean. Shell out the 50 rupees for a liter of bottled water. Do not consume ice from street stalls. As per the reasoning above, you should avoid potentially untreated water in all its forms, even when it is 100 degrees out with 85% humidity. 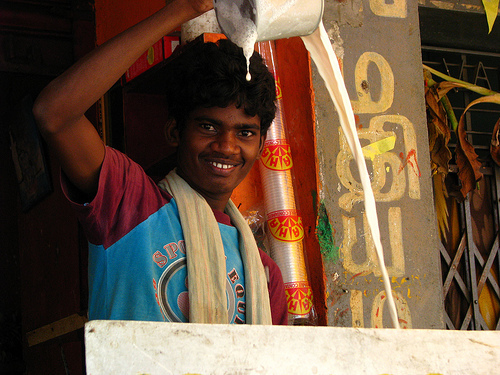 Avoid yogurt and milk-based products from street stalls. **sigh** This rule of thumb is the hardest to stomach (pun intended). Milk products like yogurt contain a high concentration of bacteria and can easily go off. Although there are some street vendors in Kolkata where it is safe to try foods like lassis and doi phuchka, it’s best to get advice from a trusted local or guide. Fruits sold on the street are best avoided. Because the fruits on the street are uncooked and exposed to the germs surrounding them, most people, including Indians themselves, choose to buy fruit at a local market and prepare it at home instead. 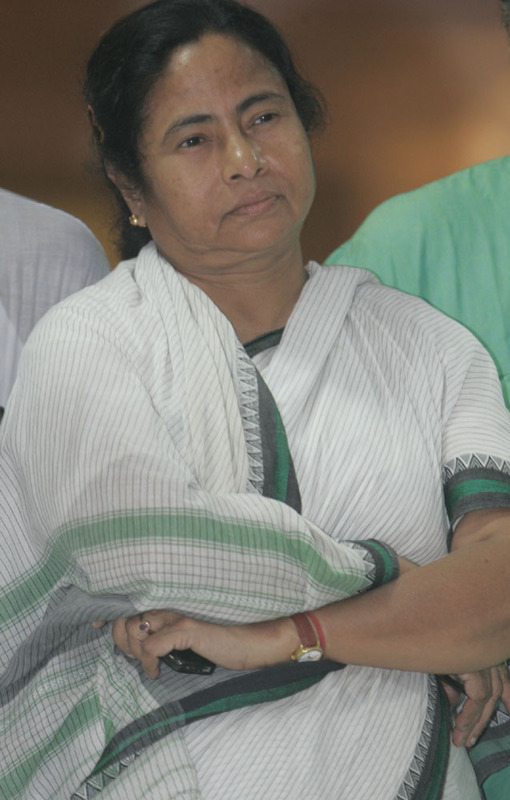 If you’re going to get sick in India, Kolkata is a great place to do it. Bengalis love taking medicine and giving medical advice. No. They’re not quacks (well, some of them are). I think it derives from their affinity for turning life into art. Giving non-professional, medical advice is an art form in Kolkata. The medicines on offer for treating any one symptom are astounding. In India, small pharmaceutical companies proliferated after the government passed the no patent law for pharmaceuticals forty years ago. Since the law was reversed in 2005, that’s beginning to change. But in Kolkata the culture of giving medicinal advice is still strong. At least fifteen medicine shops line the main road of our Behala neighborhood alone (and that’s not counting the homeopathic ‘doctors’ who sell mood rings as cures for ailments like kidney stones and cancer). Everyone has her favorite brand, and everyone is more than willing to give you the name. Over the next two days, I was given all kinds of pills to choose from – pain medications, digestive enzymes, electrolyte concoctions. On clockwork, every few hours Kakima appeared in the doorway to our bedroom. “It’s time for her to take her pill,” she’d whisper. I also received advice about what and what not to eat. Kakima, Kaku, our cook Raju, and our driver Shonjit debated amongst themselves about whose idea had the best healing potential. The food you eat here when you are sick is delicious, by the way. A vegetable soup called macher jhol, chicken stew with ginger, and a béchamel-like vegetable curry called shukto. Shukto is a bitter dish with a number of ingredients (bitter gourd, bottle gourd, raw banana). These are difficult to find in North America. But it is these vegetables that are famous for their aid in digestion. 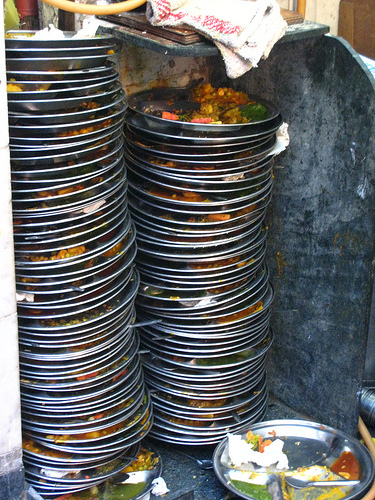 Bengalis often prepare shukto as form of cleansing the digestive tract. Raju brought me lots of tea; Shonjit ran to get the electrolytes, then popped his head in to say ‘hello.’ Sickness in India is a time for visiting, oddly enough, and, even more odd, another opportunity to bring sweets. I had a pantua, my favorite. Even Surya’s friend, Rana, called on his way to work one morning, assuring me that he had a medicine that worked wonders. For what, I didn’t know. From what I knew of food poisoning, you just had to let it pass. Ibuprofen: Both a low-grade muscle relaxer and a pain reliever! Bismuth caplets: the most common brand is Pepto-Bismol. Although bismuth relieves heartburn, gas, diarrhea only for short periods of time it’s worth taking with you for when food just isn’t sitting right. Prescription azithromycin: azithromycin is used to control diarrhea. Unlike the similar-acting luoroquinolones (e.g., Noroxin or Cipro), it can be used for children with severe diarrhea (though it is best to avoid giving these medications to children altogether). Enzyme dietary supplements: I take Beano with me wherever I go. You take a few pills just before you eat a “problem” meal (e.g. beans or, in my case at present, everything, and life becomes just a little bit smoother. Acid reducer: This is a separate or additional option to taking bismuth or enzymes. I had a helpful bottle of Zantac in my bag, until I realized it was about three years past the expiration date. Note to everyone: medications really do go bad. Oral Rehydration Therapy: If food poisoning does hit you, it’s important to stay hydrated and put back the salts and other nutrients that you are losing. In the U.S. this is sold as CeraLyte and Kaolectrolyte. Although the above may seem like a lot to take, if you pick up small bottles it really isn’t. I still have plenty of room for my antibiotic ointment, bandages, calamine lotion, and hand sanitizer. It’s also good to keep in mind that forms of each of these medications can be found in India. In case you are wondering (which you probably are), most medicines in India are safe, and you don’t need to be seen by a doctor to procure the ones I mentioned. If you are unsure what manufacturer is best, it’s helpful to stick to the biggest pharmaceutical brands, which include Aurobindo, Dr. Reddy’s, Glenmark, Lupin, Torrent and Wockhardt. These six have recently been approved for the U.S. drug market. In India being well prepared is essential. Of course, India will always kick that preparedness right to the curb. But you’ll be out of the bed or hotel room in no time and, like me, dishing into a succulent, Kashmiri chicken drumstick off the street. The Waldorf is another of those Park Street restaurants that watched the starry decades of Calcutta dim and sober as India entered the 21st century. The Waldorf is one of Kolkata’s oldest Chinese restaurants in a city famous for its proliferation of Chinese food. 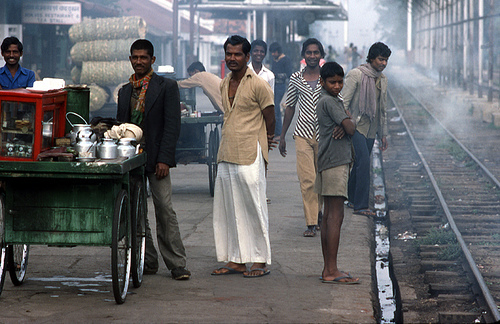 Kolkata began to fill with Chinese immigrants in the 18th century, working in the opium and tea trades of the British. The largest immigration flux of Chinese came at about the turn of the century, when Hakka Chinese, a wandering class, settled in Calcutta and took up the city’s tannery work. 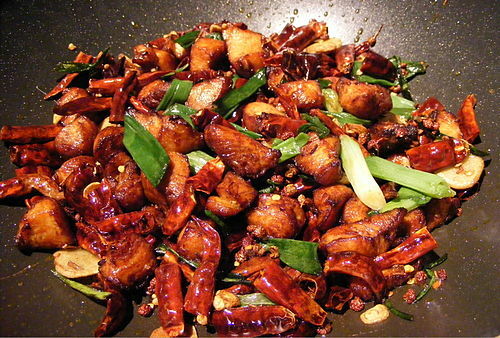 Although many of the descendents of these early settlers have since moved abroad or to other parts of India, Chinese is still the second cuisine of Bengalis, and a particular type of fusion Chinese-Indian cuisine has developed here. Interestingly, Chinese-Indian cuisine is now gaining popularity beyond India. With a little effort, you can find purveyors in London, Toronto and New York. Waldorf was the first restaurant in Calcutta to move out of Tangra, still today India’s only Chinatown, and make Chinese a mainstream cuisine for Indians. Opened by three Chinese entrepreneurs, Waldorf found a niche on Park Street and quickly became one of the landmarks of the street. It became famous for its food festivals that, for a weeks’ time, highlighted a particular ingredient — prawn, for instance — or a cuisine. We stopped in during its Southeast Asian festival and sampled Vietnamese lemongrass chicken, Cambodian prawn, and Burmese noodles. I’m now going to have to find myself a Burmese cookbook. Waldorf’s fate was luckier than some of Kolkata’s landmark restaurants; The Blue Fox and Firpo’s shut their doors long ago. Waldorf made it through the turn of this century, but not without a fight. Its story is quintessential of Kolkata today, where tradition battles with modernity and decaying history is not lovingly restored but demolished to make room for the new. Or worse, it’s just left to rot. But Park Street’s fortunes are rising, and its real estate is again prime property. In the early 2000s, the landlords of The Waldorf’s 24 B address already had their sites in mind for a new high-rise that could fulfill the demands of Park Street’s rising costs. It sent eviction papers to the restaurant, quietly barring and chaining the doors at night. When staff arrived in the early morning they were shocked to find a brick wall sealing off the entrance. They were even more shocked when their protests landed them in the Alipore jail. Temporarily? The feeble hope almost makes you want to smack the owners to their senses if it didn’t make you feel like ordering everything on the menu in a show of solidarity. Kolkata is perhaps the most nostalgic of Indian cities, and it just doesn’t seem right to kick a well-worn restaurant when it’d down. It’s like sending the Velveteen bunny to the trash heap. But we deferred, limiting ourselves to our three dishes and a couple of beers. Though we vowed to come back for the Hilsa festival the next month. Since we were on a roll that week, we thought we’d check out another landmark Chinese restaurant from Kolkata’s past. I’d passed Jimmy’s Kitchen in Park Circus before but always conjured images of a wandering American ex-pat who’d finally found his place serving up mutton burgers for the teenage crowd in Kolkata. Obviously, I was way off. Jimmy’s also opened in the early fifties, and the small black and white portrait of its original owner, C.Y. Chen, hangs behind the main counter. The restaurant’s name is perhaps a nod to a Jimmy’s Kitchen that has stood in the heart of Hong Kong since the 1920s. Jimmy’s of Calcutta was never part of the restaurant elite. 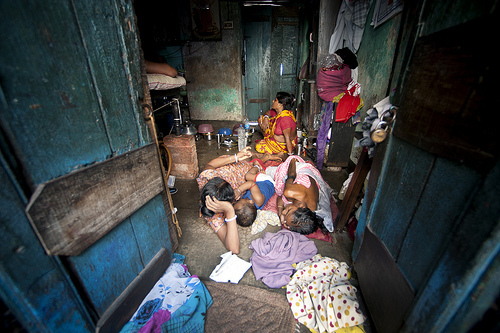 But it was famous as a watering hole for families and office workers that were building Kolkata’s middle class. Its homey, mismatched, kitsch décor (think red-lacquered wooden framework, deteriorating prints of the Chinese countryside, and an abundant use of mirrors) reminds me of the strip mall Chinese shops where my family picked up take-out orders when I was small. It’s small, it’s family-run, and it serves a huge menu with some particular Bengali favorites: sweet corn soup, prawn balls, chilli roast pork, and, of course, the Hakka noodles. The food was good, but I preferred The Waldorf. 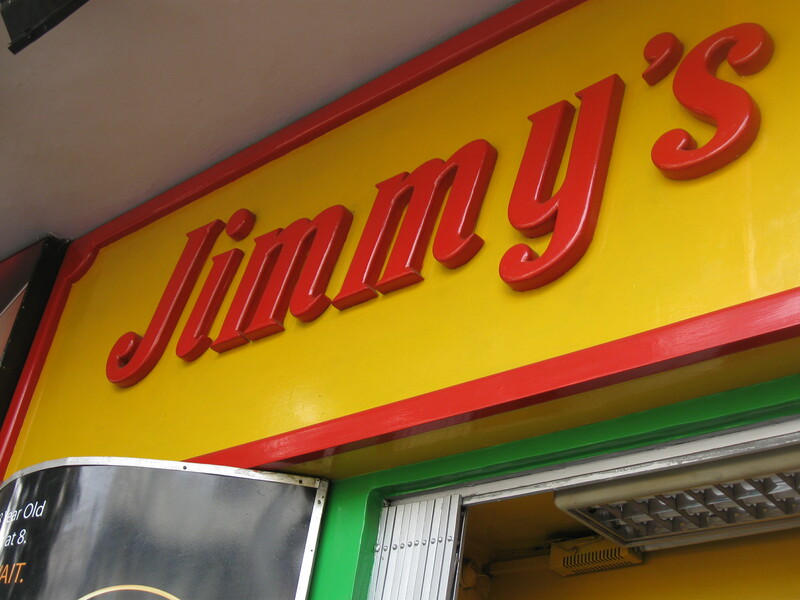 Jimmy’s chilli chicken, however, is still considered the best in the city. We didn’t order it that day, so you’ll have to come to Kolkata to see for yourself. When we first arrived, the place was dead. All but one table was filled, and any anticipation I had vanished. But as we dug into our chilli roast pork, mixed Hakka chicken fry, and chilli prawn, the clientele picked up. Next to us, an older couple slunk into a booth. The gentleman, dressed in a rumpled button-down shirt and a bit unsteady on his feet, told the waiter in Bengali that he had 500 rupees in his pocket (about twelve dollars to you and me). Would that be enough to buy food, he wanted to know. The waiter assured him it would. Yet the man hesitated. He looked unsure. He scoured the menu, asked the question again – in fact, several times. After some deliberation, he settled on two plates of noodles. Several minutes later, when the waiter came with the food, the man piped up again. Perhaps emboldened by the full plates of steaming noodles before him, he asked about having a whisky. “I think you do not have enough for that,” the waiter replied. Then he nodded his head and stepped away. The man and his wife picked up their forks. The din from the restaurant had increased now. And as families poured in from A.J.C. Bose Road, we rose from our seats, smiled as we passed the couple, and left the half-eaten chilli roast pork behind us. It just so happened that the weekend of our arrival to Kolkata was also the birthday of Surya’s uncle. 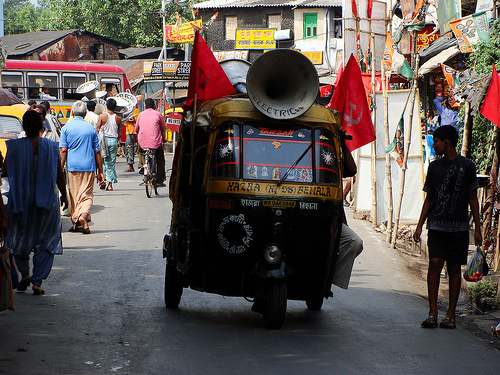 Partha, a civil servant, divides his time between New Delhi and Kolkata. Last year, in town after a business trip to Bangladesh, he joined us at a fabulous new Northwest Frontier restaurant (read: Pakistani/Afghani cuisine), Peshawri, at IT Sonar, one of the latest hotels to rise in the outskirts of Kolkata. Ironically, it bills itself as a luxury business resort that recreates the golden era of the 50s and 60s in Calcutta. But as the wealthy and their haunts shift from downtown to the outer paras, icons of that golden age sit unused, waiting for the day when the city claims them for demolition. This year, Partha was again in town with his wife Aparna, preparing for their youngest daughter’s nuptials. We took them to Peter Cat. If you come to Kolkata, you will undoubtedly be told that, to sample Kolkata life, you must go to Peter Cat. The restaurant is famous for its chelo kebabs (according to its purveyors, a protected regional product of West Bengal) and, like Peshwari, its specialty Awadh cuisine. But despite its melt-in-your-mouth kebabs, Peter Cat is famous far more for its legend than anything else. The restaurant borders on the endearing here and, like a well-loved toy, it shows in its image. It is slightly worse for wear. Peter Cat isn’t so much unkempt and fraying as it is just plain old. Its atmosphere – intentionally – resembles the decade when it first opened. That’s how Kolkatans like it. Peter Cat shares space on Park Street, Calcutta’s most famous road, with a handful of other hangers-on that hosted a glittering crowd. Back then, Calcutta was the city of the Asian subcontinent, and Park Street was more like an exclusive walking space than a regular thoroughfare. 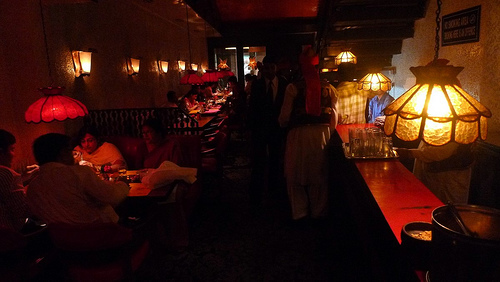 Only the best-dressed deigned to stroll past its shops and hotels, and its supper clubs like Mocambo and Trincas welcomed the best singers in the country. Patrons stepped through the doors in shining patent leather and dripped with pearls and gold, India’s favorite form of wealth. The five of us – kakima, bara-mama, bara-maima, Surya and I – sat around a circular table bathed in red and dimmed to the point that I forgot that it was one o’clock in the afternoon. The restaurant was packed. We’d been lucky to get a table upstairs, which according to everyone there, was the better section of the restaurant. They should know. They’d been coming to Peter Cat for years. In Kolkata the upwardly mobile tend to celebrate their first salary at Peter Cat. A father passes the tradition down to his son, and he to his child, and such is how the tradition continues. Our waiter (dressed in maharaja style uniform and turban) told us this crowd was only the first wave. Another would begin again at three in the afternoon. It was a typical Saturday. He’d been a Peter Cat waiter for 38 years. In the West it’s unimaginable to think of someone in his fifties having a forty-year run as a waiter. Waiting, after all, is a job, not a career. Sitting in Peter Cat it’s difficult to remember that, despite the enormous changes in Indian over the past two decades, despite its entry onto the the global stage, as its called, 75% of Indians are not upwardly mobile. And waiting in an air-conditioned restaurant is a better profession than manual labor in the suffocating Kolkata heat. At a good restaurant like Peter Cat, a waiter (females need not not apply) will earn enough to retire in the dingy, one-room apartment he rents and shares with his wife and a few family members. But he’ll never reach middle class. Indianess, even in the most westernized sections of the city, creeps up like that, and I noticed it as Kakima sipped her lime soda and hovered nervously over her brother when he ordered a second Kingfisher. Litul, Surya’s 27-year old cousin, was as versed in the cures for hangovers as any Western twenty-something of her elite class. But she’d never drink in front of her elders. And Kakima, bara-maima, and bara-mama represented a different middle class altogether, one that was a little more reserved, a little more tentative. One that respected tradition. Outside the restaurant, after our meal, as we drove through Chowringhee, Surya nudged me to look out his side window. 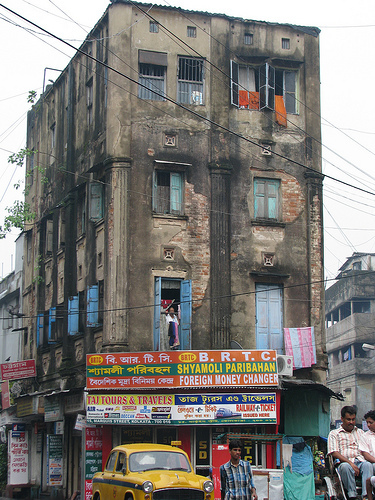 A large, white, colonial-style building stood almost stately on the corner of Hemanta Basu Sarani and Abdul Hamid Street. Save for the occasional boarded window, the patches of peeling paint. I hadn’t heard of it, and the only feature that distinguished it now was the street-level colonnade that supported the structure and served as a shady area where hawkers sold $1 waterproof watches, cosmetic brushes, men’s shirts and fresh coconut water. Back at home, I looked it up. The 165-year old Great Eastern was one of the oldest and, at one point in time, most opulent hotels in the country. “The jewel of the East.” Up to the 1970s, Indian nawabs booked its suite 209 for lavish New Years Eve parties. But in recent decades, as a public sector undertaking, the hotel dwindled. In 2005 it was sold to a private company and hammers began to break down some of its walls. 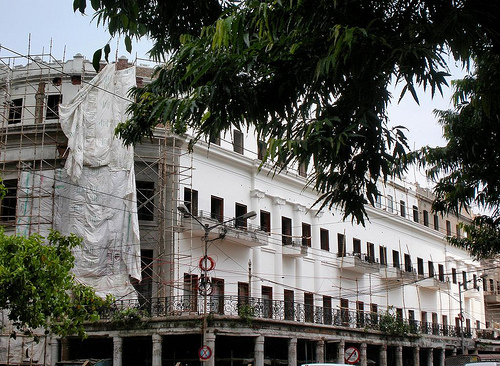 But Kolkatans love tradition, and chairman Lalit Suri pledged to undertake the hotel’s restoration. He died shortly after the project began, but in this town of all towns, they hope the hotel won’t be forgotten. Our Jet airways flight landed amid darkness at the Indira Gandhi International airport last Wednesday night. Most of us were tired, achy, yearning for a final destination. The family kitty-corner from us had a particularly disturbing trip, having a four-year-old who wet his pants, a baby who screamed for a good couple of hours, and finally the kicker – a lost cell phone. They were every parent’s traveling nightmare incarnate, and I hoped, for their sake, that New Delhi was the last stop. Surya, however, perked up as we taxied towards the gate. “Look!” he said, and everyone did. Then, ever so slightly, half smiles brightened the droopy eyes in our small section of the plane. A sky bridge had been set up for our de-planing. 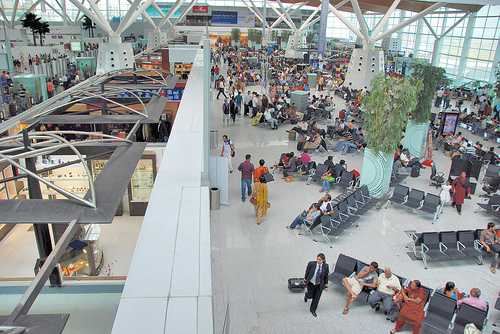 Sure enough, the New Delhi airport had received a sprucing up. We no longer would have to clang down narrow metal steps, a load of carry-on luggage on our backs. We wouldn’t brace ourselves against the blast of Delhi heat and herd, like cattle, into a slow-moving bus, where the odor of a hundred bodies was stronger then the smell of exhaust. Nope. Delhi was moving up. No doubt a result of the Commonwealth Games the year before. So, it wasn’t all a disaster. I wished for a while that home was in Delhi. Delhi is a nice city. Surya thinks it’s a little “fast” and impersonal. “Capitalism,” he says, like it’s some kind of greenhouse gas. But I like its wide, tree-lined streets, its old forts preserved right in the city itself. It’s got no shortage of restaurants, and even Kolkata’s most famous restaurant – Oh Kolkata! – now has a branch in the city. Since it’s the political capital of the country, Delhi is kept a bit shinier than most cities in India, and the place fills up every day with both Indians from all parts and people from all over the world. It’s energetic and cosmopolitan. The Delhi airport had moving walkways now, too. It had new shops and restaurants, and an airport hotel, where you can shower, take a nap or receive a massage. It even had bathrooms with sensor-activated faucets. Very cool. Kolkata, on the other hand, takes its cue from the last century, when the British Raj ruled with a confident and disciplined, albeit, unhurried hand. Then the British moved the capital to Delhi, and Kolkata’s gentility slid into the 21st century as a kind of provincialism. Kolkata’s airport is too small for its size, its bathrooms are best avoided, and the shopping consists of a small kiosk filled with ties. One doesn’t even think about taking a walk down a sky bridge. 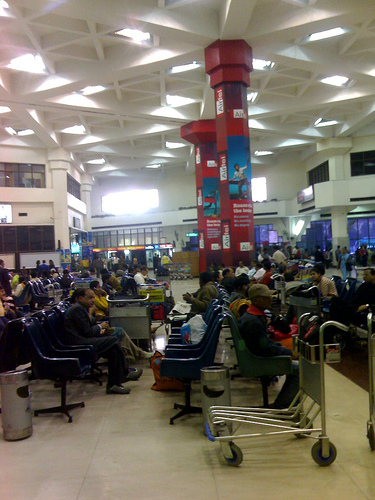 Netjai Subhash Chandra Bose Airport, I hate to admit, is worse than the desert airport in Rajasthan. Perhaps that’s what you get for naming your airport after an armed militant who collaborated with the Nazis. Against the British, mind you. Needless to say, his independence movement did not win over many Indians. I was thinking about all this for the next ten hours as we languished overnight in New Delhi (Not even pretty airports can soothe a long layover). There are only so many times you can take a turn around the waiting area with your luggage cart. There are only so many cups of Coffee Day cappuccino you can have. By six in the morning, I was eager to head to our gate. One more flight. One more two-hour car ride from the airport to home. Then a cold drink or tea in the sitting room where I could listen to bird tweets and savor a freshly cut, juicy Bengal mango, or a hot shingara. And sleep. 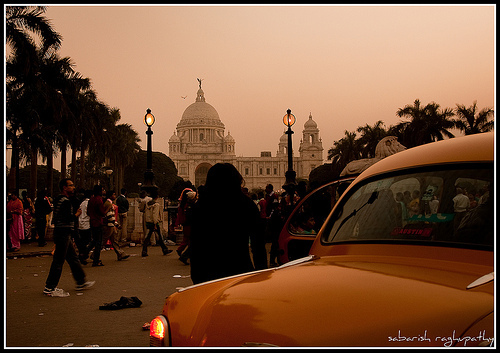 Kolkata may no longer be India’s capital, but provincial can be pleasant. Those thoughts lasted for the first ten minutes of our stroll to Gate 63. We were at about the middle of a pack of commuters, trying to keep ahead of their pace when, the next minute, gone. The crowd thinned. We reached our tenth moving walkway, and Surya joked that once we reached the end of the airport, we’d have to take a bus five miles out to reach the Kolkata flights. It was funny until, as we stepped off, we stared directly into the towering glass panes that did mark the airport’s end. Reaching gate 63, the second to last gate in the airport, was like finally realizing what it meant to hail from Charleston, West Virginia. Yeah. I bet you didn’t know that was the capital either. Of course, my natural instinct to support the underdog kicked in. What’s so bad about Kolkata? It isn’t West Virginia, after all. It’s the third-largest city in India. Is it lacking for culture? No. Is it lacking entertainment? No. It may not be the center of Bollywood. It may not be the political capital or the business capital as Mumbai and Delhi are. Maybe it’s not an immediately beautiful city, but it has resonance, a sort of historical mystique coursing through its soot-covered, peeling buildings. It’s beyond conventional definitions. It’s beyond chic. It’s über-chic. And I wondered out loud why no one else could see that. Oh yeah. Damn those communists. Calcutta certainly wasn’t helped by a British move to New Delhi and then, later, a partitioning of their region in 1947, mass migration from East Bengal and a few waves of famine. 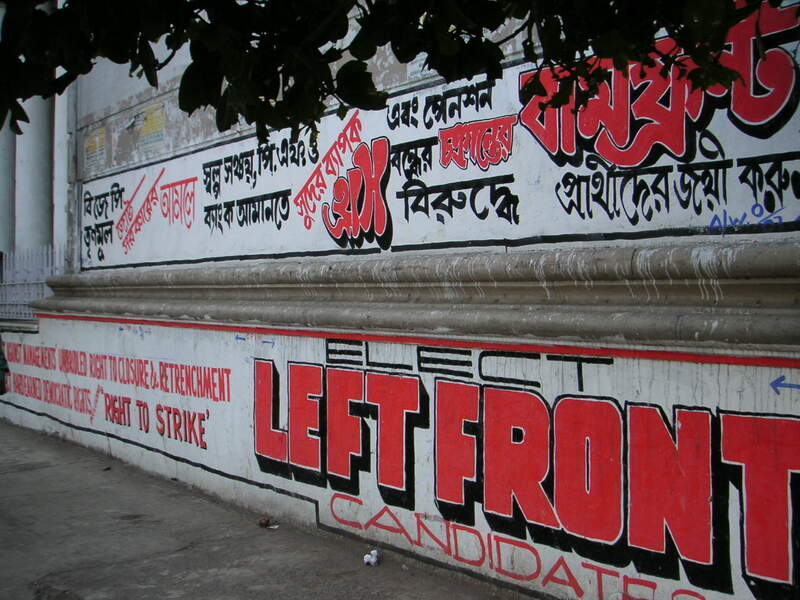 But ever since Bengalis voted in the Communists in 1977, snubbing the ruling Congress party, their fate has been in steady decline. In the 80s then Prime Minister Rajeev Gandhi called Calcutta a dying city. To some extent, he was following the Western script that characterized Calcutta as, in the words of Gunther Grass, a, “bloody great mess that was dropped by God.” Bengalis came out in protest. There is truth to that image from the West. When I first arrived in Kolkata I was overcome with the same sick and frightened reaction that nearly every Westerner has. From the airport, I looked through glass doors to see a tussle of palm trees, and other waxy green, jungle vegetation. Kolkata looked lush. But that idea was quickly eclipsed by the tarp-covered shacks that huddled in a ravine not far outside the airport grounds. Old raj-style buildings suffered from a paint job that had been slowly scrubbed away by the monsoon grime and a lack of tender care. The ubiquitous box-like housing that seems to predominate developing countries easily dwarfed that earlier, more delicate architecture. Exposed wires hung limply in every direction across the skyline. And I would have to return to the city, I thought, every year. When I heard the story of how Surya’s academic father watched all of his colleagues migrate to the U.K. or the U.S., while he refused to leave, I sometimes wanted to curse him for shortsightedness. Kolkata is a small space teeming with too many people. The population and pollution grow but the economy does not. Its internal infrastructure –water pipes, electricity, roads, you name it – requires a massive, and overdue, renovation. Poverty, poisoned waterways, and monsoons that incapacitate the sewage system are real problems. Yet the image is not a complete one. You never learn that it is Mumbai and Delhi, by far, that host the largest slums, and that those same cities face similar consequences of overpopulation (Read Suketu Mehta’s Maximum City). You never learn that Kolkatans are perhaps the most cultured, the most intellectual, and the most engaged citizens of their country. Everyone who can reads a paper. Everyone votes. And these characteristics are not simply self-flattery. The idea that, “what Bengalis think today, India thinks tomorrow,” has become a platitude throughout India, however resentfully quoted it may be. And so here I sit, having made it through the two-hour morning traffic to Kaku and Kakima’s house in Behala. The rains have yet to fall this June, and the fan whirs above me, shooing the heat away as I work. Later, we will take a walk through the market. We’ll pick up toiletries and milk, and dosa for lunch. And I’ll poke around to see just what is über out in the city today. When I think of tea, I am usually on a plane headed for Kolkata, cursing the British for inciting that anti-tea rebellion in my country some 200-odd years ago. I then wouldn’t have the nearly universal pains that come whenever you travel outside of North America or Europe: caffeine withdrawal. It’s never pretty, and in the sticky heat that invades Kolkata prior to monsoon season, caffeine withdrawal feels like malaria. I usually brace myself for this event by having a final, top-of–the-line, Starbucks’s Ethiopian bold at the airport before our departure. I add lots of sugar and cream and savor each sip, knowing that it will be the last time for a while that I will enjoy a high on the level of crack cocaine. Alas, our Starbuck’s barista was a trainee, and my anticipation dissipated as I tasted something more in keeping with Nescafe decaf. Transition nearly complete. So, when I woke up the next day on the other side of the Atlantic, and the flight attendant rattled ‘round with the drink cart, I didn’t bother asking for coffee. Already, my legs involuntarily twitched, my armpits gave off a pungent aroma, and my back ached from the indentation made by my armrest. All I really wanted then was to be home, stretched out under a blanket on my couch, with an hour of quiet, a book in hand and my cat, Yola, snoozing on my stomach. This is what tea is good for: soothing your soul. It’s pleasant; it’s mildly invigorating. It’s peace in a cup. It turns out that my image of tea is not entirely a product of brainwashing by the Celestial Seasonings marketing team. In fact, tea was first spread across Asia through Buddhist monks, who discovered that the mildly caffeinated drink helped them in their daily meditations. Tea became the most widely drunk beverage in the world precisely because it has a pleasant aroma, and is stimulating just enough for people to feel invigorated, but without the side effects of feeling drunk, dehydrated or jittery. The famous tea estates of Darjeeling, about a 9-hour drive north of Kolkata, not only were suited the cool hills of the lower Himalayas, they also made for a relaxing summer destination for the British and a therapeutic landscape for the Raj’s largest sanatorium that once stood outside the city. 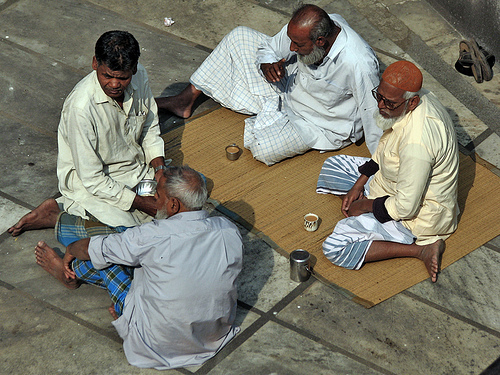 Indians, of course, are almost ubiquitously tea drinkers, and none more than Kolkatans themselves. Cha is taken throughout the day, at home, on the street, in businesses. Tea running is a paid occupation here, and many business transactions must take place over tea. 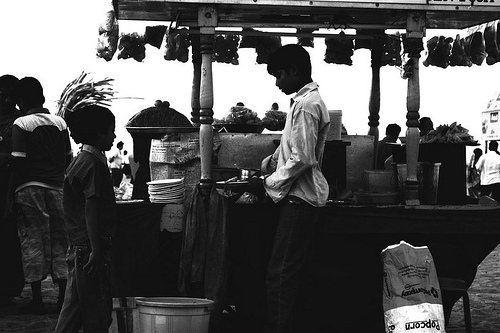 When we settled into chairs across the desk of a local travel agent a few years back, ready for a lengthy wait to make sure our papers were in order, the man clicked his fingers and a scrawny boy in a dirty shirt flew down the stairs and came back in minutes with steaming clay cups of street tea. In the same way, Surya was invited for tea while picking out meat at the butcher’s. As in Arabic culture, having tea over business transactions in Kolkata is a way to solidify an ongoing business relationship. Thousands of standing-only tea stalls dot the city and their most striking feature is the pile of rustic, terracotta cups that rises to one side of a stall as the day progresses. Patrons simply drink from the cups, then throw them onto the pile when they are done. It’s an ingenious way to keep plastic and paper from over-running the city. At the end of the day the broken shards of clay are collected, melted down, molded, and fired again into cups for the next day. Though tea’s origins are in the low, eastern hills of the Himalayas, stretching through the Indian state of Assam, Bhutan, and bordering China, tea drinking did not become habit across India until the British arrived. Having discovered the delights of tea through trade with China, the British found themselves addicted by the 18th century. It was difficult to keep the liquor flowing. England was growing and Chinese production methods were too slow to meet demands. The squeeze led to the tea tax and the aforementioned Tea Party disaster in Boston. Ironically, the growing population of Britain was so reliant on tea that British traders flooded the Chinese market with Opium from India in order to buy back tea for eager Brits at home. Of course, finding itself with a country plagued by serious addicts, the Chinese closed its markets to Britain, hoping it would get the message. It didn’t. Britain, being full of a different kind of addict, sent its forces to crush the Chinese. This is better known as the Opium War, and it was a coup for Britain at the time because China was then the most powerful empire in the world. Britain was a tiny island. The victory secured Britain with not only the port of Hong Kong but also a ready supply of tea. Still, trust was broken, and the British learned never to rely too heavily upon China for anything, particularly tea. Besides, they concluded, with their superior industrial technology, they could make a better job of tea production anyways. So, the scramble to find new tea sources began. 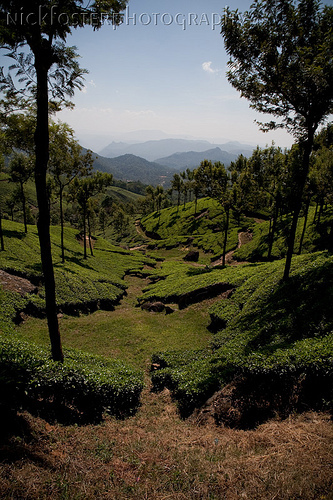 By the late 18th century, Britain was sending out a coterie of explorers in search of the coveted tea plant camellia sinensis. They finally found a similar variety in the northern parts of Assam. The British promptly captured the territory from the ruling monarch, culled the forest to make room for tea plantations, devastated the local Assamese population, and carted in tea workers from China and Kolkata on filthy trains, where sometimes more than half of the recruits died. Another percentage died a few months later from the grueling ten-hour days or the squalid shacks that were their sleeping quarters. 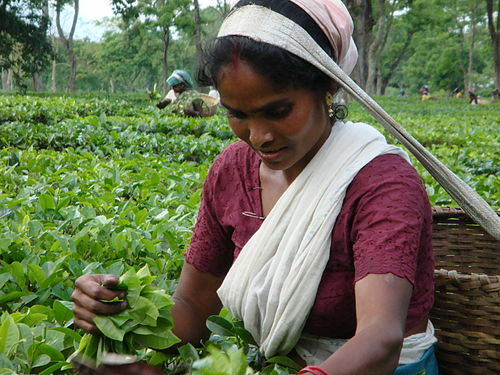 Thus the exploitation associated with tea production began. Eventually, the British experimented with tea production in Darjeeling. It took off and ended the Chinese monopoly of tea. Today, Darjeeling tea is considered the “champagne” of teas, and India is the largest producer and consumer of tea in the world. The center of that action is Kolkata. Tea auctions and tea tastings are always happening in the city. Bengalis have thus learned to be picky about their tea. Though you’ll receive the ubiquitous cardamom-flavored, milky tea on the streets, in homes or upscale tea shops most people prefer their tea straight, with few additives to ruin the flavor. To some extent this world is changing. With globalization, and in particular more investment from America, coffee has begun to make inroads into India. Though the majority of Indians still drink tea, coffee has come to be seen as a hallmark of 21st century sophistication. Coffee bars akin to Starbucks dot the more affluent areas of Kolkata, though most customers sit at tables drinking smoothies and milkshakes rather than coffee. It’s the caché that counts. 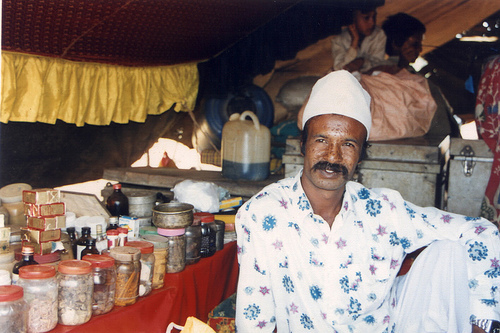 Tea still dominates the Bengali life and, as with most other tea-drinking communities, Bengalis have elevated tea drinking to high culture. Taking tea is almost synonymous with the art of adda, a term which has no true English equivalent. It is the art of good talk or intellectual exchange, and it is best served over a steaming cup, or three, of cha. Or, in my case, sometimes a good ol’ cup of coffee. Best let me tell, for none hath subtler sight. Ishaq ibn Ibrahim al-Mawsilí, the celebrated Persian singer and poet from the 9th century, had also an eye for good food. He likely penned the praise poem for the samosa after a day of feasting at the court table of the Abbasid Caliph Haroun al-Rashid. Al Rashid was a lover of all things cultural, the finest poets and choicest ingredients alike. Al-Rashid has been lionized in stories from The Book of One Thousand and One Nights, but he is best remembered for his exquisite taste and determination to enhance the court at Baghdad with riches from across the massive empire that he ruled. The Abbasid Caliphate extended from the Atlantic Ocean to what is now Turkmenistan, from the Black Sea in the Persian North to India in the South. Al-Rashid brought talents from East and West to his court: learned men, poets, jurists, grammarians, scribes, wits and musicians. At his court table, he lavished guests with gifts and introduced them to his sugar from Khuzestan, the finest pomegranate jam, white honey, rosewater, dates, and caraway seeds. A hand of cumin, murri just to taste. Good master, haste to grind them small and strong. It was tradition on most days at court that poet musicians vied to present the most outstanding lyrics, hoping to be the recipient of the gifts Harun bestowed on his favorites. Perhaps this day al-Mawsilí had his first bite of what Persians called Sambosag, and early version of the samosa. Or maybe that day he tasted a particularly fragrant example, with the pastry roasted just so, the pepper from India, and the ginger from China. Perhaps he wrote thirty lines in jest. Since when do courtly poets write praise poems for so humble a snack? Upon it from above, and cover o’er. Far from the courts of any Caliph or Mogul, the samosa né sambosag was first prepared by traders from the steppes in Central Asia at the very edge of al-Rashid’s empire. These semi-nomads needed foods they could pack and carry during long journeys across the Silk Route. They prepared the savory, bite-sized pastries over campfires and the next day dropped them into saddlebags for safe keeping on the road. Since then the samsa, as it was called there, has not stopped its journey, and there are possibly as many variations of savory pastries as there are countries today. In Turkmenistan and other parts of Central Asia the samsa is often a rough pastry filled with ground meat or pumpkin, greens and herbs. In the Arab world, the sambusak or sambusaj is traditionally filled with meat and onions, punctuated by sweet almonds or raisins. Sweet versions contain ground almonds, dates and walnuts with rose or orange blossom water. Iraqi Jews brought to Israel the boureka made with a light and flaky puff pastry. 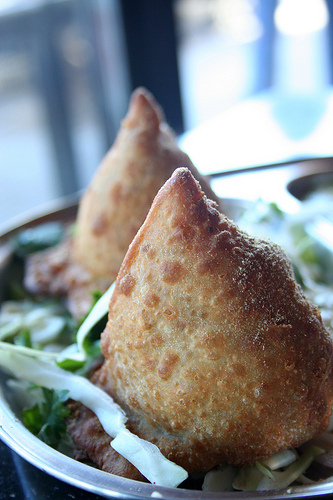 Samosas are found across Africa, too, and food historians have found links between the samsa and the Latin empanada. And with the nails its edges docketed. And in that liquor let it finely broil. The humble samsa cast its influence wider than al-Rashid himself. 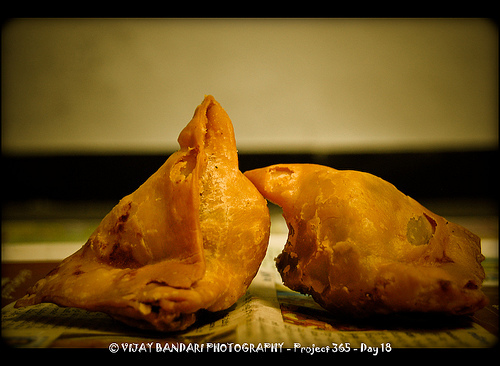 But today it is most familiar in its Indian incarnation, the samosa. The samosa is so widely known and devoured that in Arab restaurants in the West you won’t often find sambusaj or sambusak, but you can order a samosa. In India samosas are just as diverse. The plump, Punjabi samosa resembles Persian varieties in that you can find it stuffed with potatoes, pomegranates and raisins. In Bihar, ginger and green chilis are the predominant seasonings. In Rajasthan you’ll find dal, or lentil, samosas, and in the South you’ll find daintier onion samosas which South Indians call, Samsa. 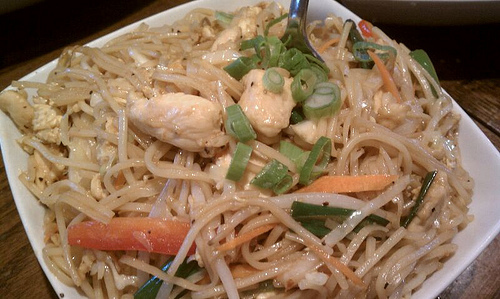 This tastiest food for hurried dinner-out. The Bengali shingara is merely another incarnation of a universally loved food, simple, but in possession of a far-reaching history. Though it is my favorite, by far. Nothing is better than its melt-in-your mouth pastry, its mix of cauliflower and potato filling and a finish of Bengali panch phoran. Here is one Bengali-inspired recipe published in a recent issue of Upper Crust, India’s premier food and style magazine. It’s a great resource for looking beyond the standard travel and food guides. The recipe is provided in metric weights and measurements. A convenient conversion calculator can be found here. Collect all spices and broil lightly. Grind into a powder. Peel and cut potatoes in small dices, wash and cut the cauliflower in to small florets. Heat oil in a kadhai, fry the cauliflower and set aside. Fry the potatoes and set aside. Fry the green peas and set aside. Mix together the potatoes, cauliflower, green peas, spice mix and green chillies. Add the black salt and adjust seasoning to make a tasty stuffing. Mix the flour, 100 gm ghee, salt and water to make a soft pliable dough. Divide the dough in 15 roundels. 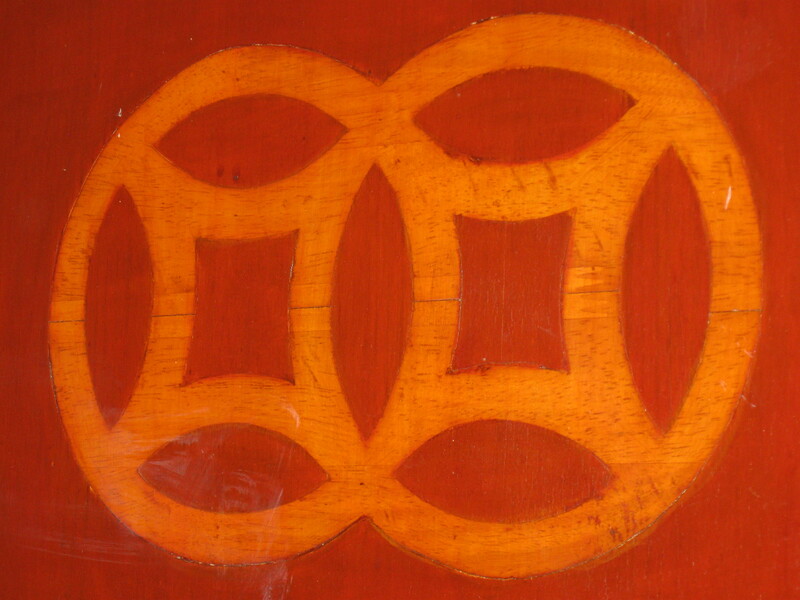 Roll each roundels in an oval shape and cut into two, enough to make a shingara wrapper. Shape each wrapper into a cone and fill in the stuffing. Seal edges by pinching them together to make a shingara shape. Heat the remaining ghee in a kadhai to smoking point. Reduce the heat and slow fry the shingara till the exterior is cooked and takes on colour. * Black salt is a pungent, blackish-pink salt used in Indian cooking. You can find it a South Asian grocery stores locally and online. In North American, whole coriander is commonly known as cilantro. Maida is a refined, wheat flour in Indian. It can be purchased at South Asian grocery store, but you can also substitute it with cake flour or all-purpose flour. These days it is the samosa that inspires poetry, from mimicry – “Oh, my luve is like a deep brown samosa,” – to this 21st century love story by Nilesh Patel. Make a batch of shingara. Sit down, watch, and enjoy.